Things have slowed somewhat with my traps. Last night I hived a strangler, Trap03, after I got off work. It came from a new site. There had been a hit on it previously this spring. “On 5/13 – HIT, but the bees left on 5/15“. They had constructed a large piece of comb on the bottom of the trap, then left. It was a first for me. I removed the comb and told the host I wasn’t giving up on the site. Last week the host informed me that the bees were back, and were coming and going five and six at a time. I asked if pollen was entering. He said “#$%^!!!! they were coming and going too fast to see!” He saved me a trip by shutting the door to the trap the night before pickup. Having a good trap-host is worth a lot. Trap03 after hiving has become 2010. This colony received a top entrance (TE). This group was hived at Hive Site 06 (HS06). They will become 1210. Four of six frames had capped brood on both faces. They had been there longer than a week, but hanging unmolested in the tree had apparently been good to them! All combs were built well along the frame with no cross combing problems. This hive was given a Top Entrance (TE). Hiving has been going better this year due to being too busy! I haven’t had time to hive things the same day as moving them. I had done that a lot last year. 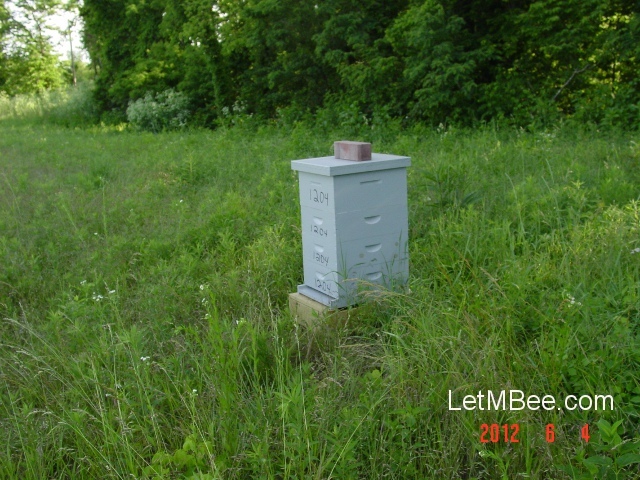 Come to find out, hiving is easier when you wait a couple of days after moving bees from trap site to hive site. Transfers seem to be less stressful to the bees and they clear out of the trap more quickly without the need for shaking. Worth writing down…. 1204 doing well just a short ways away from 1210. It was hived 5/12. Largest swarm caught to date in 2012. If you haven’t got a trap out yet GET IT OUT!!! There is still time to get good genetics this year. Think you have a valid reason to not be trapping? Leave it in the comments……. 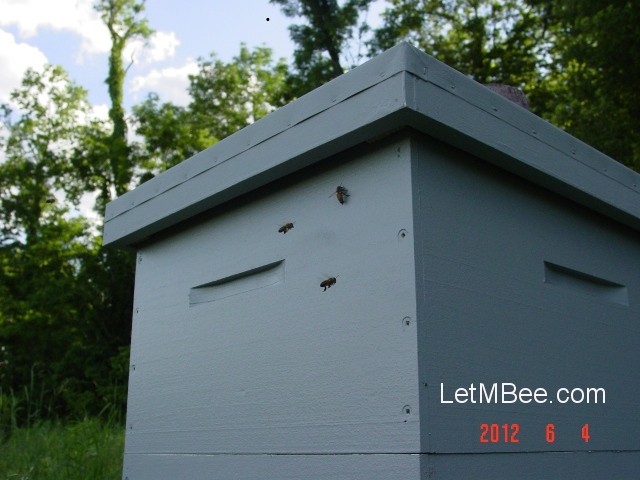 This entry was posted in Posts, Swarm Trapping and tagged bait hive, bee genetics, beekeeping, feral bees, feral hives, foundationless frames, Indiana beekepeing, Jason Bruns, swarm trap, top entrance. Bookmark the permalink. No good reason not to have a trap, but sadly, no one has visited yet. I am waiting for bees to rain on me especially after the failure of our “swarm”. Do a bee-rain dance. Your neighbors may think you are crazy. My neighbors are pretty sure I am crazy….. 🙂 I think I may just have to do a little jig in the front yard the next time I see some cars coming.